Enjoy a Portugal riding vacation along the wildly beautiful Alentejo Coast a south-central region of Portugal. Alentejo is comprised of pretty whitewashed villages, historic sights, olive groves, verdant rice fields, eucalyptus forests, Atlantic beaches and small villages where travelers may feel that they are stepping back in time. The region’s name is derived from “Além-Tejo,” which means “beyond the Tagus,” the river that flows past Lisbon. This area attracts a variety of birds, including colonies of storks, and invites travelers to slow down and enjoy life! Ride striking Lusitano horses, a Portuguese horse breed, closely related to the Spanish Andalusian horse. These horses are well trained and comfortable to ride with an enthusiastic walk and easy collected canter. Choose from a variety of Portugal Riding Holiday Itineraries that take you on circular routes or progressive rides, including horseback riding on the beach. The Dolphin Trail and Bottlenose Trails include a half day boat trip to look for dolphins–– a special experience. Ride to picturesque villages and stay nights in small boutique guesthouses or large hotels, some with swimming pools. You should be a confident rider at various paces, including the walk, trot and canter. It is important to be fit enough for the long canters in the heat of the Portuguese sunshine. Your horseback riding vacation is in the Alentejo region of Portugal, south of Lisbon. The temperatures are pleasant nearly all year round, with coastal breezes ensuring it is never too hot. Ride beautiful Lusitano horses, a Portuguese horse breed, closely related to the Spanish Andalusian horse. Horses are well trained and comfortable to ride with an enthusiastic walk and easy collected canter. Choose from a variety of Portugal Riding Vacations that take you on circular routes or progressive rides, including horseback riding on the beach. The Dolphin Trail and Bottlenose Trails include a half day boat trip to look for dolphins–– a special experience. Ride to picturesque villages and stay nights in small boutique guesthouses or large hotels, some with swimming pools. Accommodations vary from beautifully renovated former farmhouses to luxurious, modern hotels. Almost all have swimming pools. The rooms all have private showers / toilets, and some have a bathtub. The rooms mostly have two beds that are made up separately but pushed together, so you can separate as you need. Inermediate to advanced riders who want to enjoy horseback riding on the beach, visiting local villages and soaking in Portugal's vibrant history and culture. This is a progressive riding vacation that takes you along the coast of Portugal and inland to enjoy mountains. You'll stay in hotels and guesthouses along the route, enjoying horseback riding on the beach, through pine forests, visiting historic fishing villages, and hidden gems in Portugal. * Prices shown are subject to changes in currency conversions. Accommodation; full board; wine with lunch; all riding; excursions as per itinerary; transfers (at set time) from Lisbon. Drinks; tips. International flights to Lisbon/ Portugal. Arrival in Lisbon and transfer at 17:30. You will travel to the town of Melides, approximately 135kms south of Lisbon. Settle into your room at Hotel Vila Park, a nice country hotel. Later at dinner you will meet your guide and learn all about the trail. Dinner and overnight in Hotel Vila Park. Today you meet your horse and ride towards the beach. Between June 1st and September 15th, this ride is at dawn to avoid the holiday makers on the beach. It’s a beautiful ride at first light as the sun rises over the dunes. If everyone is comfortable and secure on their horses, then there is the possibility of a gallop or canter on the beach before reaching a lovely picnic spot in the pine forest where your horses rest while you may swim in the sea and later have lunch. For lunch, a delicious picnic will be prepared with grilled meats or fish with salad accompanied by fresh bread and local wine. After lunch, you ride through the dunes, returning to the hotel. Dinner is at a local restaurant and overnight at Hotel Vila Park. Today you ride in the direction of Santiago do Cacém, past the Santo André Lagoon. In this beautiful place you may see flamingos and storks. Ride past the rice fields of the area, which in late summer prior to harvest are an astonishing colour of green. Stop for a picnic in the pine tree forest. After lunch you continue towards the Quinta da Ortiga where we will stable the horses. A short transfer of 30 min takes you to your hotel, Monte do Xisto, a modern, luxury rural hotel, where you have dinner and spend the night. Today you continue to ride southwards towards Cercal, always with the sea in sight. Climbing the mountain through the ‘montados’ you ride through one of the last unexploited regions of Portugal. In the afternoon you arrive at your accommodation at Casas Verdemar. This is a beautifully renovated tavern with individual rooms and cottages around the gardens. There is a pool, fruit trees and plenty of places to relax and enjoy the countryside. Take your meals either on the veranda or inside in the dining room. Your hosts are Christine Nijhoff, a specialist in antiques restoration and Nuno Vilas Boas Lebreiro, artist and cook. Dinner and overnight at Casas Verdemar. From today until the end of the trail you will do a star type trail. Today you have a morning ride exploring the fields around the farm and trails into the mountains of Cercal. The afternoon is free to visit the fishing village of Vila Nova de Milfontes which is a popular seaside resort in the summer months. There is time for shopping, sightseeing or relaxing on the beach. Today after breakfast you set off into the mountains of Cercal, close to the dam of Campilhas where you have lunch. The scenery is varied and interesting and after some trots and canters you return to Verdemar. Relax and enjoy the quiet of a typical ‘monte alentejano’ after a dip in the pool. For your last day’s ride you continue exploring the mountains of Cercal. You will ride to the chapel of Nossa Senhora das Neves from where you have a splendid view of the surrounding area. After lunch, you return to Verdemar. Farewell dinner and overnight at Casas Verdemar. After breakfast, transfer back to Lisbon and departure. Arrival in Lisbon and transfer at 17:30. We take the direction of the Cercal Mountains, approximately 200 km south of Lisbon. You will stay overnight at Casas Verdemar, a rural, renovated farmhouse. Here you can relax, and enjoy dinner and your first night in Portugal. Casas Verdemar is a beautifully renovated tavern with individual rooms and cottages around the gardens. There is a pool, fruit trees and many places to relax and enjoy the countryside. Take your meals either on the veranda or inside in the dining room. Your hosts are Christine Nijhoff, a specialist in antiques restoration and Nuno Vilas Boas Lebreiro, artist and cook. Today for your first day’s ride you explore the mountains of Cercal. You will ride to the chapel of Nossa Senhora das Neves from where you have a splendid view of the area you have been riding through in the morning. For lunch, a delicious picnic will be prepared with grilled meats or fish with salad accompanied by fresh bread and local wine. After lunch, return to Verdemar. Today we ride through the mountains of Cercal. We will have our usual picnic near the beautiful dam of Campilhas. The afternoon is free to visit Vila Nova de Milfontes, a fishing village close to the sea, with a very nice beach and spectacular views of the ocean. This is a great destination if you like to swim in the open ocean. Overnight and dinner at Verdermar. Today we ride inland enjoying many canters through eucalyptus and pine forests. After lunch in a shady place in the woods, we continue towards Quinta da Ortiga where you leave your horses before a short transfer of 30 min to Monte do Xisto, a modern, luxury rural hotel in the vicinity of Santiago do Cacém. Dinner and overnight at Monte do Xisto. Today we ride in the direction of the ocean and reach Hotel Vila Park. After lunch we pass through rice fields we continue in the direction of Melides, an area of great peace and tranquillity. The beach is about 3km away so if you have enough energy left from the day’s ride, you can enjoy a nice swim before dinner. We will stay in Hotel Vila Park, a nice country hotel. Dinner in a local restaurant and overnight at the hotel. Today you leave Hotel Vila Park to ride in the beach. Between June 1st and September 15th, this ride is at dawn to avoid the holiday makers on the beach. It’s a beautiful ride at first light as the sun rises over the dunes. There is the possibility of a beach canter before reaching a lovely picnic spot in the pine forest where your horses rest while you may swim in the sea. After lunch you ride through the dunes, returning to Hotel Vila Park. Farewell dinner and overnight in Hotel Vila Park. *This itinerary is a sample itinerary. Itineraries are subject to changes due to the weather, the trip guide's discretion and other factors. Please note that this riding vacation also runs either North to South or South to North. The Blue Coast or Costa Azul encompasses the southern stretch of Portugal’s west coast. This coast is as long and beautiful as Portugal’s popular and world famous south coast ‐ Algarve ‐ but, while the Algarve is crowded with tourists, one finds deserted beaches and pristine countryside along this coast, even during the summer months. Discover this Portuguese jewel by horseback on a world famous Portuguese Lusitano. On this Portugal riding vacation, traverse the lush, green coastal mountains of Grândola, rich with pine, cork forests, to the inviting turquoise waters and beaches of the coast. Enjoy an excursion to the mouth of the river Sado to observe Bottlenose dolphins in their natural environment. Your accommodation will include re‐furbished traditional Portuguese farm houses as well as modern comfortable hotels. * Prices are subject to changes in currency conversions. The single supplement can be refunded if you are willing to share and we can find someone to share with you. Arrival in Lisbon and transfer at 17:30. You will travel south to Barradas da Serra, approximately 100km. Your accommodation is a rural house – a typical ‘Alentejana’ architecture which is located in the region of Grândola. Herdade das Barradas da Serra is very pleasant with charming staff and is equipped with the comforts of a modern hotel. Here you will find a relaxed atmosphere where you can swim in the pool or rest in the comfortable rooms before your first day on horseback. Today you will ride through hilly landscapes to your first destination – Santiago do Cacém. After the first few canters, you will notice the Lusitanos’ wonderful character and their sure‐footedness. For lunch, a delicious picnic will be prepared with grilled meats or fish with salad accompanied by fresh bread, soft drinks and local wine. In the afternoon, rested after lunch, we ride through the forests of pines and cork. You reach Quinta da Ortiga where we will stable the horses. A short transfer of 30 min takes you to your hotel, Monte do Xisto, a modern, luxury hotel, where you have dinner and will spend the night. Today you will traverse forests of eucalyptus, enjoying their distinctive perfume and hearing the sound of the bark crunching underneath the horses’ hooves. Near Morgavel’s Water Reservoir we stop for a picnic lunch and a relaxing siesta. Afterwards we have the opportunity for some fast canters on the sandy trails that cross this Portuguese countryside. Dinner and the overnight at Monte do Xisto. Today, either in the morning or afternoon, you will be transferred about 30 minutes to north to the Sado River where you will enjoy a two hour boat trip to see the dolphins play in the estuary. Dolphin sightings cannot be guaranteed,as they are in wild but are very likely. Also please note that the boat trip is subject to weather conditions. When you ride today you will explore sandy trails through fields and forests, allowing several long canters. You ride past the Santa André Lagoon and in this beautiful place you may see flamingos and storks. Ride past the rice fields of the area, which in late summer prior to harvest are an astonishing colour of green. Dinner and overnight at Hotel Vila Park. Today you ride from Hotel Vila Park to the beach. Between June 1st and September 15th, this ride is at dawn to avoid the holiday makers on the beach. It’s a beautiful ride at first light as the sun rises over the dunes. There is the possibility of a beach canter before reaching a lovely picnic spot in the pine forest where your horses rest while you may swim in the sea. After lunch ride through the dunes, in the direction of Hotel Vila Park. Dinner at a local restaurant and overnight in Hotel Vila Park. Today we ride from Melides towards Grândola. Many opportunities for faster riding occur today. Our Lusitanos will carry us safely through forests of pines. Red earth paths alternate with those of sand and we may meet herds of cows or sheep tended by shepherds. On our return, we can enjoy a nice refreshing swim in Barradas da Serra before dinner. Dinner and overnight in Herdade das Barradas da Serra. Today the group rides by the Serra of Grândola through a rolling landscape of picturesque villages. We stop for the last picnic of the trail, horses and riders can take a siesta after lunch. Then we proceed to Herdade das Barradas da Serra. *This itinerary is a sample itinerary. Itineraries are subject to changes due to the weather, the trip guide's discretion and other factors. 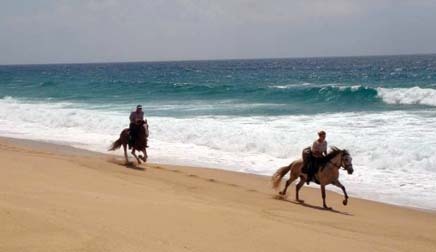 Ride the famous Portuguese Lusitanos on this coastal riding vacation. Travel over pristine, deserted beaches and idyllic countryside. Riding through the protected sanctuary at the mouth of the river, Rio Sado, you will find endless miles of sandy beaches, interrupted only by small fishing villages and lagoons. Enjoy an excursion to the mouth of the river to observe Bottlenose dolphins in their natural environment. Discover the quiet tranquillity of the pine forests as you ride towards the shores of the Lagoon of St André. The ride ends with superb canters over the rolling hills of the Serra Grândola. Arrival at Lisbon and transfer at 17:30. You travel to Grândola, approximately 100km south of Lisbon. Your hotel is Monte das Faias which has a refined ambience and charming staff, you can unwind in comfortable rooms before the first day on horseback. Dinner and overnight at Monte das Faias**. Today you ride through hilly landscapes to our first destination in Santiago do Cacém. After the first few canters and gallop, you will notice the Lusitanos’ wonderful character and sure‐footedness. For lunch, a delicious picnic will be prepared with grilled meats or fish with salad accompanied by fresh bread and local wine. In the afternoon, rested after lunch and perhaps a siesta, you ride through the forests of pines and cork to Quinta da Ortiga where the horses will rest. There is a small transfer to your hotel, Hotel D. Nuno, with a swimming pool in which you can take your first swim. Spoil yourselves with a pleasant dinner in a local restaurant eating typical Portuguese food. Overnight at Hotel D. Nuno. Leaving from Quinta da Ortiga we ride through forest of eucalyptus, with their distinctive perfume and the sound of the bark crunching underneath the horses hooves. Near Morgavel’s Water Reservoir we stop for a picnic and a relaxing siesta. Afterwards, appreciate the marvellous gallops on sand tracks across the Portuguese countryside. Dinner at a local restaurant and overnight at Hotel D. Nuno. Today, either in the morning or afternoon, you will have a short transfer about 30 minutes to Setubal at the Sado River where you will enjoy a two hour boat trip to see the dolphins play in the estuary. Dolphin sightings cannot be guaranteed but are very likely. Also please note that the boat trip is subject to weather conditions. When you ride today you will explore sandy trails through fields and forests, allowing several long canters. You ride past the St. Andre Lagoon ‐in this beautiful place you may see flamingos and storks. Ride past the rice fields of the area, which in late summer prior to harvest are an astonishing colour of green. Your accommodation is at the modern, comfortable Hotel Vila Park, where you can enjoy relaxation and a swim in the pool. The course of the morning excursion continues in direction of the beach. You will make long gallops on the beach. Ride through the forests of pines and by the hills of the Atlantic coast, close to the Lagoon of St. André. This place provides an extraordinary feeling of freedom and tranquillity ‐still waters, flights of birds and the green of the pines make it a very special experience. In the afternoon we arrive at the stables of the St. André Riding Centre. Tonight we have dinner at a local restaurant with traditional Portuguese food. Dinner at a local restaurant and overnight at Hotel Vila Park. Today you ride from St. André towards Grândola. Many opportunities for wondrous gallops are possible. Our Lusitanos will carry you safely along red ground paths that alternate with those of sand, where we might meet herds of cows or sheep. Today you ride near the Serra of Grândola through a beautiful landscape of picturesque Portuguese villages. We stop for the last picnic of the trail, horses and riders can take a siesta after lunch. Farewell dinner and overnight at Monte das Faias**. ***This itinerary is a sample itinerary. Itineraries are subject to changes due to the weather, the trip guide's discretion and other factors. Please note that this riding vacation also runs in reverse. According to many people this is considered to be the top horseback holiday in Europe. Rivers and creeks meander through spectacular scenery of rolling hills and pastures to make this central region of Portugal rich in flora and fauna. In the spring, flowers are abundant in the meadows with spectacular color. This area is also home to two of the National Portuguese studs farms and the largest breeding area for fighting bulls in Portugal. This is wonderful horse country with soft trails through pleasant countryside. You will stay in beautifully renovated private estates that used to be the residences of noblemen. Beautiful antique furniture and art create a special atmosphere that makes these accommodations a highlight of this trail. This ride takes you over hilly meadows without any fences or roads to Lake Maranhão. You cross several bridges, many of which were built by the Romans; until you reach Alter do Chão. Here you will visit one of the headquarters of the two National Portuguese Stud Farms. This will be a highlight particularly for lovers of Portuguese horse breeds. Hundreds of mares and their foals graze on large meadows, while the stallions can be viewed in the spectacular barns. Arrival in Lisbon and transfer at 17.30. You will travel to the town of Figueira e Barros, approximately 150kms north‐east of Lisbon. For your first night you stay in a renovated farmhouse named Monte do Padrão.. This is a lovely historic accommodation with a very welcoming host who may invite you to enjoy some of the wines from his cellar. Overnight and dinner at Monte do Padrão. Meet your horses and ride over hilly meadows and down to a river, where you stop for lunch. This is a large‐scale land‐holding and there are few fences and roads. Most of the stone bridges over the numerous rivers date back to the romans. For lunch, a delicious picnic will be prepared with grilled meats or fish with salad accompanied by fresh bread and local wine. In the afternoon you continue along the banks of the river – it may be necessary to dismount and lead your horse over some particularly rocky sections. The day ends at Monte dos Aroeirais where you can spend the evening and dinner in the beautiful garden by the pool. Dinner and overnight at Monte dos Aroeirais. Today you ride from Monte dos Aroeirais to the town of Alter do Chão, through meadows where they raise wild bulls. After a picnic lunch and siesta you arrive at the Alter Real stud farm where the horses are stabled. Dinner and overnight at the comfortable 4‐star Estalagem ‐ Varandas de Alter. Today in the morning you will ride through the vast flower‐filled meadows on the lands of the stud farm. After lunch at the hotel, you will visit Alter do Chão, the stud and breeding farm. Horses bred here are very famous and traded under the name Alter. This is often a highlight and not only for horse‐lovers. In this idyllic location, hundreds of mares and their colts graze on large meadows filled with flowers. You should also get the opportunity to see some of the stallions and young horses. Return to the town of Alter where, time allowing, we stop at a Portuguese tack shop where you can buy local riding products such as leather chaps, boots or belts. Dinner and overnight at Varandas de Alter. Today, leaving the stud farm behind, you ride to Ribeira da Seda through large meadows with only one remote farmhouse to remind you of the presence of people. Horses will stay in Monte do Padrão. The day ends with a small transfer to the manor of Monte dos Aroeirais. Today you ride through the fields of the 3000 hectare farm of Monte do Padrão., exploring the great plains of the upper Alentejo, which are home to extensive fruit and olive orchards. Dinner and overnight at Monte do Padrão. Today you ride from Monte do Padrão. towards Lake Maranhão through the private hunting grounds of Calatrava, consisting of open fields and cork forests. There is lots of opportunity for long trots and canters. You enjoy lunch on the banks of the dam before returning to the farm by a similar route. Farewell dinner and overnight at Monte do Padrão. There are exhilarating canters and long, unhurried lunches... The diverse scenery has made the trip memorable and there is praise for the sweet-tempered horses. The riding was amazing - horses so steady on their feet and cool about everything and anything. A lovely trail ride on well-schooled Lusitano horses, normally famed for their excellence at dressage.